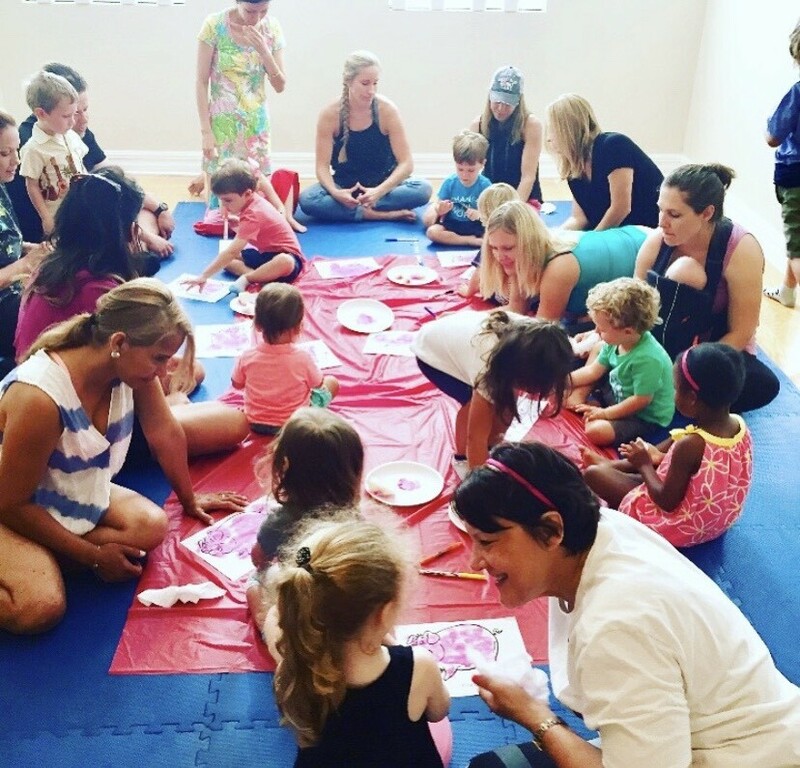 Mommy & Me style class. Dads are welcome too! Research supports that during early childhood there is a window of time when a second language is most easily learned when exposed on a consistent basis and is better achieved through social interactions. 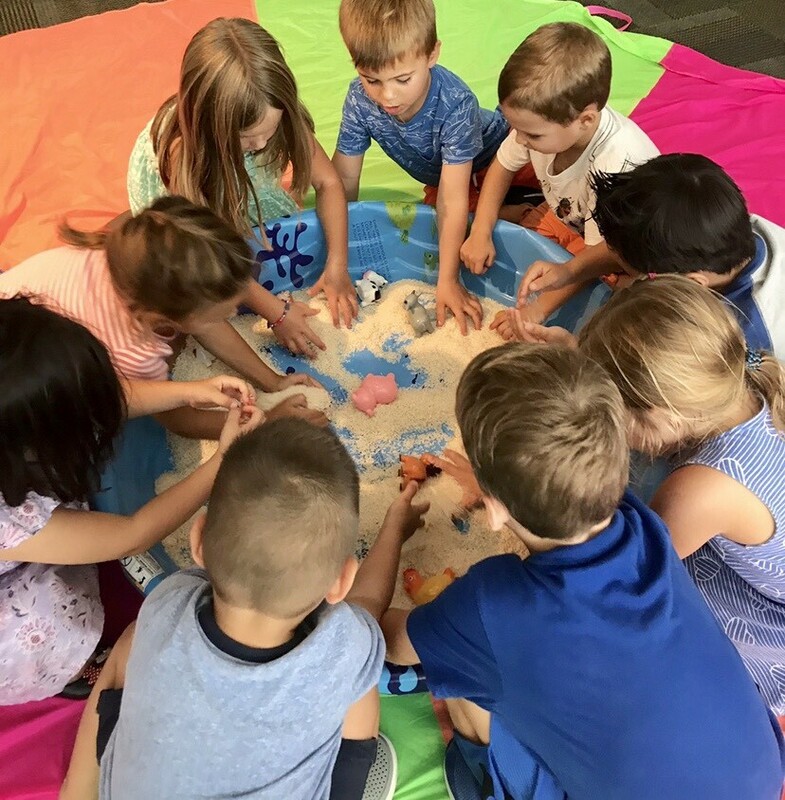 Taking advantage of this period of time, we introduce your child to a high energy, fun and engaging curriculum where they will learn in a natural way, using an immersion and play based approach families bond and learn together through themed lessons. 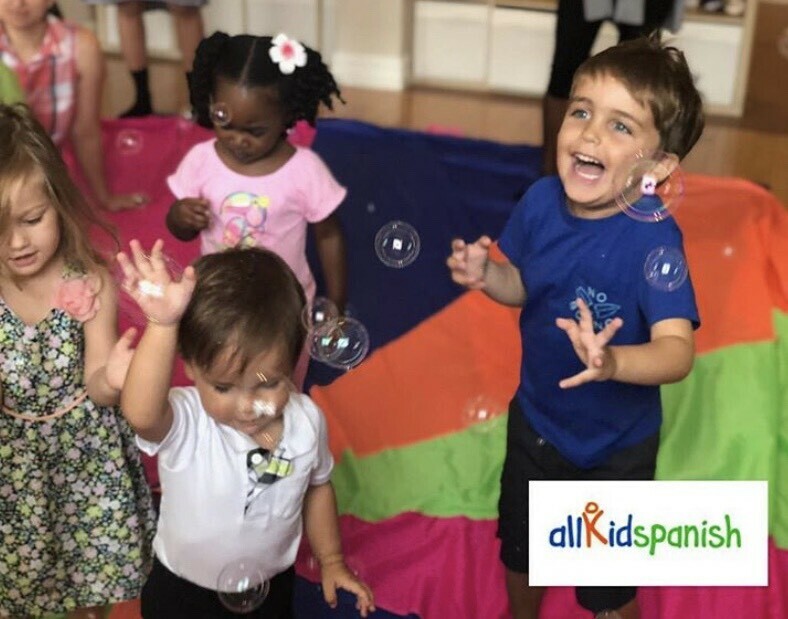 Our program is founded on simple sentence structure & vocabulary, repetition, intonation & sounds through a nurturing, family Spanish immersive experience. 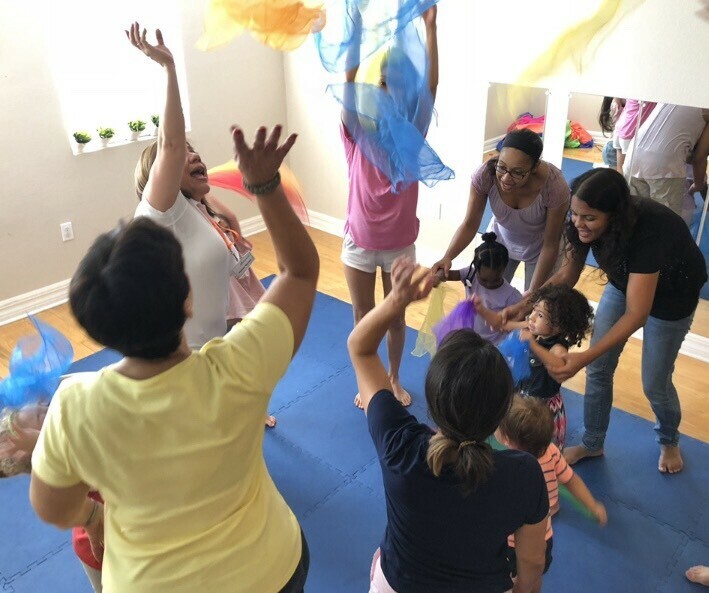 We provide a structured yet very fun class routine which includes, activities such as parachute time, music & movement, games, songs, story time, arts & crafts, puppets interactions and more! Language is also combined with cultural exposure. This is a year round program which runs for periods of 8 week sessions at a time. Each session has a specific theme. Join our Spanish learning adventure, schedule your free trial today! Call 321-460-2844. Multi-age class. From 18 months to 4 years old. The first step to introduce your child to second language learning. For 3 and 4 year olds. 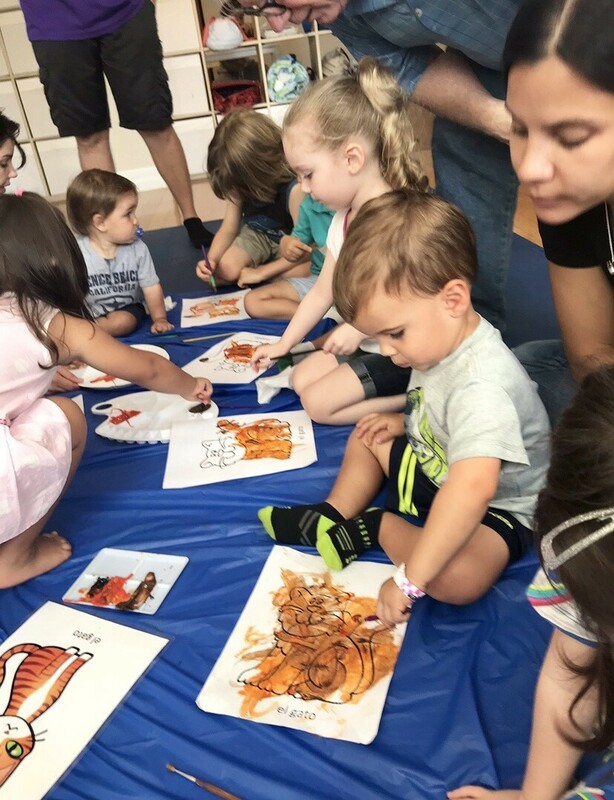 The preschool/ intermediate level is a 60 minute class length that expose children to more complex aspects of the Spanish language. *One time registration fee $50 per family, includes a Spanish musical CD + class materials & supplies. Beginners Level $105 per 8 week session per child. Intermediate Level $120 per 8 week session per child. Siblings get a 10% discount. Siblings under 18 months attend for free. Must have a paying sibling enrolled. Families can join the program at any point during the session in which case, the system will pro-rate the price. Please take note that pricing and discounts at locations other than our Spanish Language Hub may vary. Children who attend the “Los Pollitos Dicen” program tend to advance very well when they join the K-5th grade “Descubre” program. We highly recommend to enroll your children as early as possible to accomplish the best results. 2902 N Orange Ave. Suite 206 Orlando Fl 32804. Most of the classes are held at this location. Please check schedule. Our teachers are native Spanish speakers, hold degrees in the educational field, have wide experience working with children, are trained in our methodology and have been background checked. Classes at this location are held On Fridays 10:30 to 11:15 AM. The price for the class at this location includes admission to the playground before or after class. Pricing for this location is different from the pricing at the hub in Orlando. Follow us in our social media!